This painting is dedicated to the fearless and tireless Oaxacan teachers, who have fought for decades for freedom and dignity: for themselves and for all of us. Forward to revolution! Love and solidarity from Boston, MA. Funding by the Freeman Society for the Revolutionary Arts. Oaxaca, a state in Mexico’s south, has a long tradition of resistance going back to the arrival of the Spanish. Strong anti-authoritarian currents exist, and it was Oaxaca that produced the first prominent anarchist protagonist of the 1910 Mexican Revolution, Ricardo Flores Magón. On June 14, 2006, three thousand police attacked the teachers’ yearly strike and encampment in the main city plaza (Zócalo) of Oaxaca City, the state capital. This encampment was different from those of the past twenty five years, because it called for a raise in the minimum wage for everyone in Oaxaca, Mexico’s poorest state. When the police attacked, the people of Oaxaca came to the teachers’ defense. Poor workers and Indigenous people flooded the streets of Oaxaca City, driving the police out and building barricades to keep them out. Then they went further. They ran out the politicians, occupied government buildings, radio and television stations, and created the Popular Assembly of the People of Oaxaca (APPO), demanding the ouster of Governor Ulises Ruiz Ortiz (URO) of the conservative Institutional Revolutionary Party (PRI). APPO assemblies sprang up all across the state. URO responded by raising paramilitaries from those he could convince to take up arms against the rebellion. Cops, city councilmen, workers, and even judges formed URO’s right-wing paramilitaries and attacked the barricades by night with machine guns from pickup trucks. They sabotaged radio stations and abducted revolutionaries. Yet in the face of this violent repression, the people came out in mega-marches of up to 800,000. When paramilitaries evicted a women’s group from the state television station, people responded that night by taking over every commercial radio station. When vigilantes killed a rebel in an attack on occupied “Radio La Ley,” the people expanded their barricades into the hundreds. They held the city for five months, fending off helicopters with the sun’s glare off of mirrors and fireworks shot from PVC pipes. For the most part, the confrontational actions of the Oaxacan rank-and-file revolutionaries stood in contrast to the developing central leadership of APPO, which included more than just anarchist and Indigenous Magónista groups. Leftists of all brands, the PRD (the Party of the Democratic Revolution, Mexico’s mainstream liberal party), and even Stalinists used the revolt to push their agendas and to build political careers. APPO leadership insisted on only non-violent resistance and on October 29, two days after paramilitaries killed four Oaxacans and an anarchist journalist from New York, Oaxacans painted their hands white and filled the streets to attempt to peacefully halt the procession of thousands of Federal Preventative Police (PFP). Police carried automatic weapons, wore riot gear, and came with tanks that tore through barricades. By the end of the night, the PFP had dislodged the APPO encampment from the Zócalo. There was little violent resistance, or at least not enough to keep the PFP out of Oaxaca City…. However, there were instances when the people matched the violence of the state, and came away with victories. At one point, rebels popped all four tires and smashed the windows of a bus carrying the PFP, forcing a retreat, but APPO leadership denounced this and other confrontational actions. On November 2, thousands of rebels successfully defended APPO’s main radio station, Radio Universidad. They won an hours-long running battle at the barricades, and again forced the PFP to retreat. But one by one, barricades and radio stations fell…. We’re only missing one venue now for tour for the band i play in, Jake and the Infernal Machine, here’s the dates and locations. Hope you can come out and see us! 8pm at Grant Street Neighborhood Center – 271 Grant St., with Ismail and Co.
Jake and the Infernal Machine, tomorrow! We’re getting really close to releasing a new album. Currently we’re working on final mixes, coming up with an album name and creating album art. This weekend my family and I were back in Pittsburgh, where we had spent almost a year back in 2011 while my partner went to grad school. I got a chance to speak about my book Nine Years of Anarchist Agitation: The History of the Boston Anti Authoritarian Movement and Other Essays at the Big Idea bookstore. It was wonderful to see so many of my comrades and friends from our time in that city. Folks filled the basement of the bookstore and after I told my story we discussed anarchist organization and participation in social struggles. It was very interesting hearing about locals’ experiences with Occupy Pittsburgh, updates on Pittsburghers for Public Transit, the Shadbush Collective and other anti-fracking struggles, and I got to share news from the Insomnia Cookies campaign waged by our local Boston Industrial Workers of the World, and the formation of the Black Rose Anarchist Federation. On Sunday, March 9, just six days after a settlement between Insomnia Cookies and four workers who went on strike last August, the company suspended bicycle delivery “driver” and union organizer Tasia Edmonds. Quick action by the Industrial Workers of the World, which represents Edmonds, the four strikers, and several other area workers, forced the company to reinstate Edmonds. Two dozen IWW members and allies picketed the Boston Insomnia Cookies location, where Edmonds is employed, on Friday, March 14. Organizers planned another rally for Saturday, March 22, after student allies from the abutting Boston University return from Spring Break, but the company capitulated, agreeing on March 20 to bring Edmonds back to work. Edmonds was disciplined for speaking out against workplace injustices, which the boss called “Insubordination.” According to Edmonds ““I was suspended for my union involvement. I have never been disciplined before. I was not served any paper work detailing why I was suspended. I want to get back to work, and I want back pay for the days I missed.” While Insomnia has reinstated Edmonds, as of press time there is no confirmation that she will receive back pay for time lost during her suspension. The union is prepared to fight to win Edmonds’ lost wages, and to ensure Insomnia Cookies sticks to its promise not to discipline or intimidate workers for union organizing. Picket lines have returned to Insomnia Cookies, less than two weeks after the company settled with four workers who struck in August of 2013. 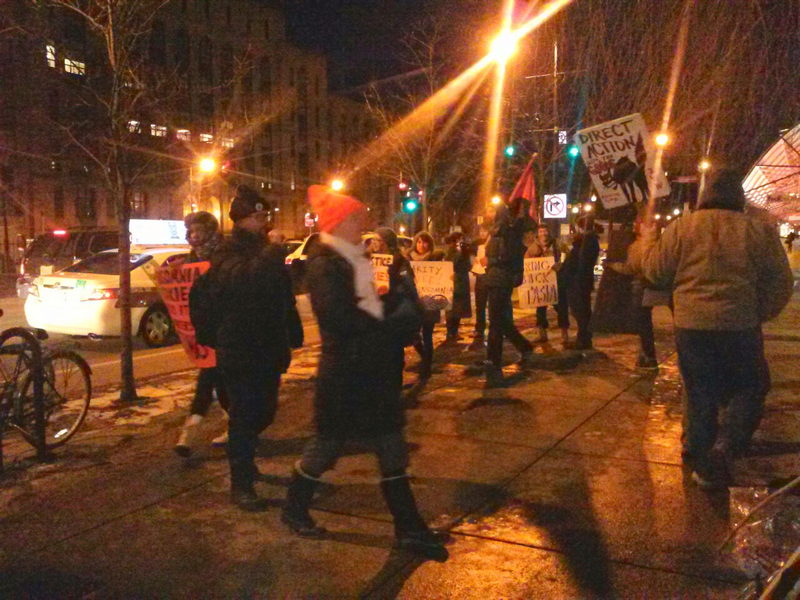 On Friday March 14, two dozen union members and supporters rallied in front of the Boston location of Insomnia Cookies, demanding the reinstatement with back pay of union organizer and bicycle delivery “driver,” Tasia Edmonds. On March 9 the company suspended Edmonds without pay for a month, alleging insubordination, while the union maintains she was disciplined for her union-building efforts. The Industrial Workers of the World (IWW), of which Edmonds is a member, claims the company violated the terms of the recent settlement, in which Insomnia Cookies promised “WE WILL NOT fire you or take any other action against you because you engage in protected activities with your fellow employees that concern your wages, hours and working conditions, including a strike.” The union filed new charges against the company with the National Labor Relations Board (NLRB) on Wednesday, March 12, and launched a phone and email blitz of the company. At the March 14 picket, workers and allies held signs, sangs songs, and handed out fliers demanding the company bring back Edmonds, make up for any lost wages, and uphold the promises outlined in the recent settlement. 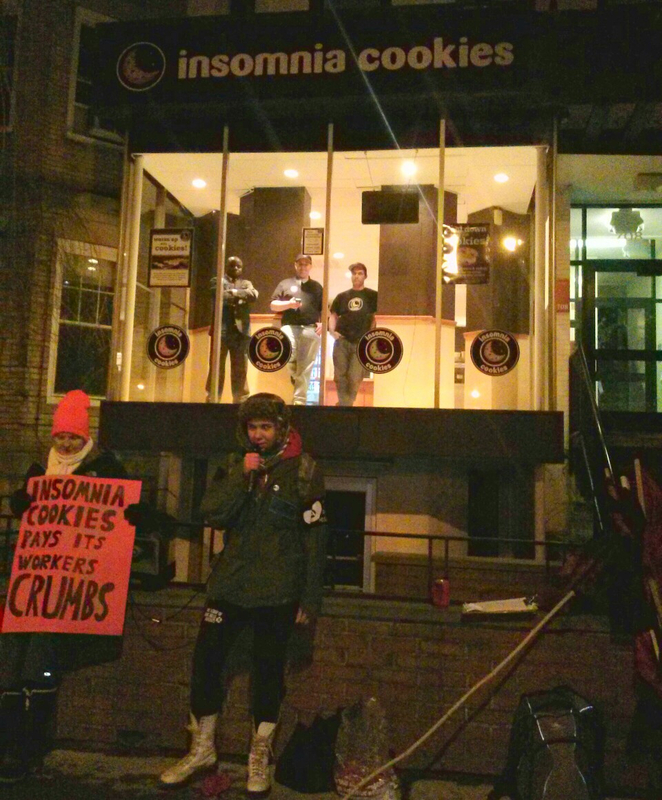 Edmonds addressed the rally, speaking about life working at Insomnia Cookies, while the manager who suspended her and a new security guard subcontracted through Securitas glowered down from the window above. Alberto Giorgio Peniche, from Boston Resist the Raids, also spoke, expressing his solidarity with Insomnia and other fast food workers and drawing the connection with the struggles of undocumented workers. After almost two hours of rallying, the IWW promised to return with double the numbers, unless Edmonds is reinstated. “Are you tired of having us in your face?” they chanted. “Then get some justice in this place!” The union is planning another rally for next week, when student allies at Boston University, which abuts the Commonwealth Avenue Insomnia location, return from spring break. “I believe I was suspended for my union involvement,” says Edmonds, a twenty-two-year-old who has worked for the company four and a half months. “I have never been disciplined before. I was not served any paperwork detailing why I was suspended. A few days after my suspension, the company even called me to ask for my story, as if they were asking me why they suspended me and didn’t even know themselves.” Edmonds went public with her union affiliation on December 7, 2013. In February, according to the union, a new manager began harassing her about her union membership. March 14 Picket at Boston University Insomnia Cookies. Photo by Jake Carman.